Microdermabrasion is a safe, non-chemical, non-invasive skin resurfacing treatment. Using a controlled spray of micro-crystals, the outermost layer of dry, dead skin cells are removed, revealing younger, healthier looking skin. The hand held device allows your skincare specialist to target specific areas of concern. 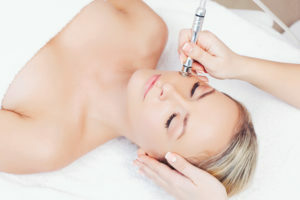 This treatment is an alternative to Microdermabrasion. Using a fine scalpel blade to the gently re-surface the skin, with the added benefit of also removing vellus hair (peach fuzz) from the surface of the skin. To view and find out more about our Enzyme Facial Peels click here for our Facials page.